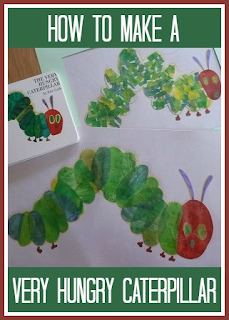 In June, author Eric Carle celebrated his birthday and so I thought I would try and find out a bit more about Eric Carle, the author of The Very Hungry Caterpillar among many other books. You can learn a little more about Eric Carle here. While I was looking for some more information about him, I discovered his own fab website, where he shares the way that he creates his distinctive collages. I thought it would be fun to have a go at making our own Very Hungry Caterpillar pictures. It's really very simple. Just take some large squares of tissue paper (I never buy it, so the stuff that I have around is more than likely stashed packaging material from something). Then paint with slightly watered down poster paint. You can paint one colour at a time and build up the colours as they dry, or I put blobs of different colours together on a palette (we use a margarine tub lid) and let the colours mix as they are painted. I used two shades of green, yellow, and a small amount of blue. I also made a small square of red for the head, with a tiny bit of blue paint mixed in. Use bold brush strokes, and it doesn't matter if the tissue paper rucks up a little bit. When all the painted tissue paper is dry you can begin your collage. We made two in slightly different ways. For my larger collage, I cut out all the shapes that I needed to form the caterpillar freehand and stuck them down on a large piece of white card. For Harry's collage I drew him the outline of a caterpillar, then we cut up the tissue paper into little squares and glued them down inside the outline. When they were dry we cut them out and re-mounted them onto thin cardboard. Then we added finishing touches with a felt pen and coloured pencils - outlining in yellow and adding feet and feelers, then using pencils to make the hairs on the back. They were a bit bumpy, so I covered them with clear sticky backed plastic, and we made a simple frame for the smaller one. Making these pictures was so easy, and I'm really pleased with the final results! Thank you! I have put one up in each child's room, I'm really proud of them! Thank you! It is a fantastic book, I loved it as a child too and it was the first book I bought when I found out I was pregnant! That look so good - in fact it's uncannily like the original! His website really is super isn't it? Thank you, I was really pleased with how well they turned out, and it was so easy! It is a fantastic website, he really interacts with his fans.